TOKYO (Bloomberg) -- Toyota Motor Corp.'s Prius C, its cheapest hybrid vehicle, failed to receive a recommendation from Consumer Reports magazine, which said the subcompact hatchback offers a harsh and noisy ride. The Prius C, which starts at $18,950, scored 53 out of 100, one point below its main competitor, Honda Motor Co.'s Insight, Consumer Reports said on its Web site. Still, the C offers "excellent" fuel economy of 43 miles (69 kilometers) per gallon and 37 mpg in the city, the best of any car tested, according to the magazine. "Its harsh ride, noisy engine and cabin, and slow acceleration make it feel more like an econobox than a sophisticated hybrid," Consumer Reports said on its Web site. 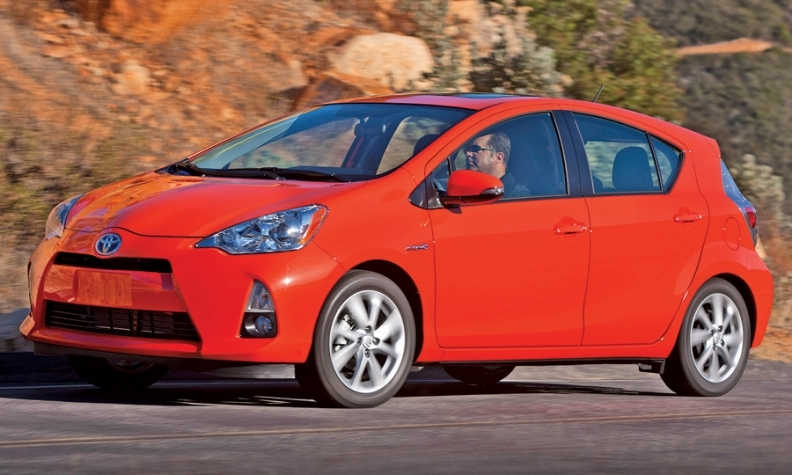 "We can't recommend the Prius C because it scores too low in our tests. We do expect it to have very good reliability." Toyota cars are among the most frequently recommended by the magazine published by New York-based Consumers Union, a non-profit group. Carmakers seek favorable evaluations from the magazine, which is seen as more objective because accepts no advertising and buys every vehicle it tests. Joichi Tachikawa, a spokesman for Toyota in Tokyo, said he couldn't immediately comment on the Consumer Reports review. Toyota started to sell the C, called the aqua in Japan, in the U.S. in March, with sales reaching 8,901 units during its first 49 days on the market, according to the company's Web site. The subcompact is part of the four-model "family" of Prius vehicles, which became the world's third best-selling car line in the first quarter.